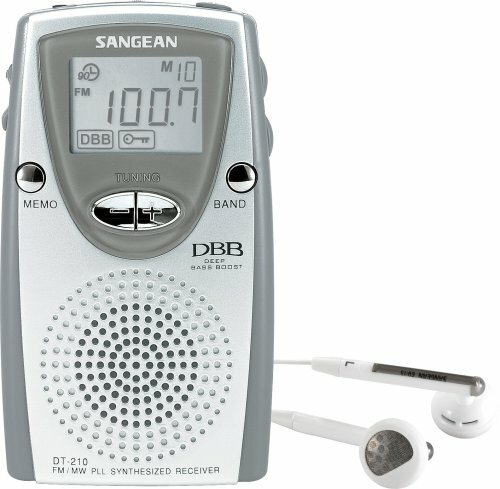 Don't let the diminutive size of Sangean's wonderful DT-300-WV fool you--it performsbetter than many large radios we've tested and comes with enoughfeatures to keep anyone happy. In addition to an excellent AM/FM digitalreceiver, you can use the device to pull in weather band frequencies and localTV stations that broadcast on VHF channels 2-13. A digital LCD displays thefrequency or station you're tuned to and also serves as a clock. The DT-300-VW's ability to pull in signals simply awed us. We used the devicefor weeks in a basement office that's notorious for bad radio reception, and thesmall radio was locking onto stations that no other device we've tested couldeven detect. A handy auto-scan feature makes it easy to find stations, and youcan establish up to nine presets on each band the radio can access. A button onthe front let us switch to mono mode to reduced static from weak FM signals, anda switch on the top can lock the unit so that inadvertent button presses don'tchange the station or turn the radio off. The sound quality from the built-in speaker is merely decent, and the includedearbud headphones offer a similarly tinny level of performance. We plugged abeefier set of headphones into the DT-300-VW and were stunned with thedifference it made. The little radio was pumping out a rich, clean signal thatmade listening to stereo FM music a joy. The radio also is capable of extremevolume that overpowered our headphones at high levels. Sangean has made an innovative little radio that is easy to use and a pleasure to listen to hour after hour. The DT-300VW crams a lot of features into a very small package. It slips comfortably into a shirt pocket, and it's a perfect portable radio to bring to baseball games and other sporting events. I have had mine since 1998, and I still use it fairly regularly. It is easy to flip through memorized channels with the up-down buttons. The digital readout tells me the station instantly, without the guesswork of analog radios. I can change bands with the touch of a button, and another button allows me to search for a new station. There is also a stereo-mono button for improved FM signal reception. The radio provides 9 memory positions for each band (including weather), which is plenty for most users. When favorite channels are memorized, it becomes extremely simple to find something to listen to. Sangean did not scrimp on performance. Reception is very good, and sound quality is excellent, especially on FM. I personally find the FM sensitivity above average but not awesome, although "your mileage may vary." The headphone cord acts as a de facto antenna, so it is impractical to listen to the radio's external speaker without a headphone attached to attract signals. I like the simple blue on/off button at the top, which is very easy to find quickly and without looking. I also appreciate the lock switch, which keeps from changing the controls unintentionally. But, if the radio does switch on accidentally, it turns off automatically in about 90 minutes, saving battery power. Battery consumption is very respectable. Having used my radio for probably more than 250 hours, I can say the average battery drain for a set of AAA batteries has been about 9-10 hours. That is well along par with any Walkman-type radio, especially considering the battery size and the radio's features. Of course, using the radio's external speaker for extended periods will reduce battery life significantly. Judging from its small size, it's clear that the external speaker wasn't meant for demanding use. However, in a generally quiet room, with the radio less than three feet away, the speaker does just fine at low to moderate volume. Anything more is asking too much. This is primarily a headphone-oriented radio, and the speaker is simply a nice extra for some flexibility. I've gotten several interesting reactions from people encountering the radio for the first time. On one occasion at work, the radio was hidden in my shirt pocket as I listened quietly with the external speaker. A visiting co-worker was truly puzzled at the mysterious sound coming from somewhere around me, until I showed the radio. His look of incredulity was priceless. On another occasion, an envious teenager wanted to know what it was, because he had mistaken it for a pricey MP3 player. I have used several ultra-small radios like this. In the 1980s, Toshiba produced a very small, analog AM/FM stereo that was about the size of a Zippo cigarette lighter. It performed very well, although the retail price was prohibitively high. 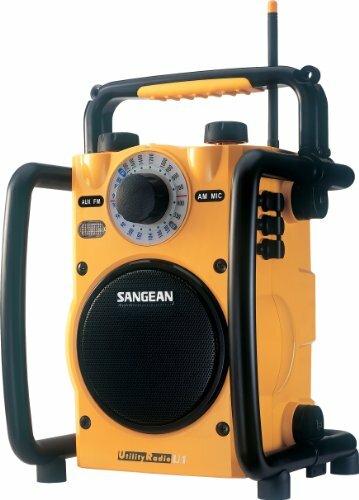 Today, this Sangean radio tops it in all respects, and at a reasonable discount price. It is well worth the money. I use this radio when camping, hiking, commuting, and during power-outages. I listen to all four bands it picks up--sports on AM, NPR news FM, NOAA WX, and PBS TV. I've been impressed by the sound it cranks out of its tiny little speaker. I'm sure that an audiophile would call the sound 'flat' or 'shallow' or some such word, and quite rightly, but if you want four bands four people can listen to for four ounces, this is the radio for you. Reception varies, of course. This design relies on its headphone jack for antenna. With the included headphones plugged in, this little radio receives FM clearly, AM well, NOAA erratically (often lots of static, but you can always get something), and TV quite astonishingly well. I have always used the headphone cord as the antenna; the purpose-built antenna cord is much shorter and less effective. Battery life has been good, and the radio uses AAAs, which are easy to find. I use rechargeables exclusively, and most chargers which will do AA also charge AAA. The earbuds aren't particularly comfortable, but they're not particularly uncomfortable, either. Their cord tangles if you so much as look at it, but is still working one year later, and showing no signs of giving up. And now, durability--this radio's downfall, in my opinion. It's a featherlight, take-it-anywhere size, with weather band built in, but it just didn't take kindly to ordinary camping bruises and bumps. I know, I asked a lot of this little gadget. It's been dropped on park-service concrete tables. It's jumbled around in purse and pocket. It's operated bravely through thunderstorms and dewy-damp mornings. It has, in fact, died on me. It comes with a flimsy, leatherette slipcover suitable for decoration, not protection. Skip it. Find a generic neoprene or otherwise cushy, protective, rugged, shock-absorbing, case for this radio. That's what I'm going to do. 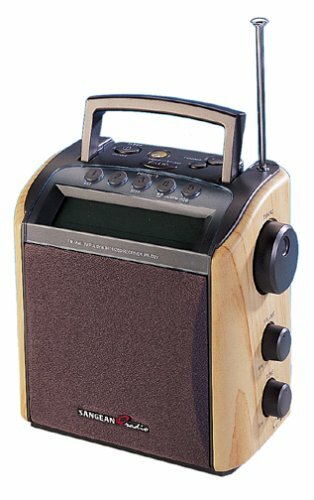 Yes, I'm buying a new one--because one year later (2003), I still can't find any other model with a speaker, AM, FM, TV, and WX under four ounces. I love radios and have owned over thirty. I am constantly looking for the holy grail - a radio with great reception and plenty of features. I haven't found that yet but I can do comparisons. Here are the pros and cons of this one:Pros:1) This is truly a pocket radio and very light. It feels lighter than a deck of cards.2) Digital tuning - a rarity in pocket radios. You can quickly scan from station to station and from AM to FM to TV.3) Has a speaker built in. You don't need headphones. The sound quality is adequate for talk radio and AM music. The volume is adequate for quiet environments.4) It has TV audio and the reception was ok on the four major stations in my area.Cons:1) There is no built in FM telescoping antenna. You need to insert headphones or the included wire and switch it to speaker in order to get most FM stations. A small telescoping antenna would have been an improvement. I find the hanging wire annoying and I think it is just a matter of time before I lose the wire.2) The reception is not as great as the Amazon review suggests. I found that there was a good deal of static on several AM stations and AM is very dirctional. FM was great on headphones, though.3) The cary case is a joke. It looks like an afterthought. It is a membrane thin piece of vinyl that will not protect the radio.4) The ear buds are also a joke.5) Weather reception was the worst I have ever heard on a modern radio.6) The tuning light is bright and, no doubt, draining the batteries like crazy.If you are looking for a pocket radio that is digital and has a built in speaker, this will do. I see lots of room for improvement, though. I also think it is overpriced. I think it should be 39.99. It would be about right at that price. I'll try not to repeat the comments I've read in the other reviews, other than to say that the AM sensitivity and selectivity are very good, the FM is good, and the TV is adequate.The weather band is another story. The sensitivity is very poor and the selectivity is non-existant. You will only get one weather station (the strongest). Let me give you my opinion as to what Sangean did to add the weather band. They probably took the regular FM or TV tuner section and made it go up to 162mhz to pick up weather stations. This may sound like it should work, but the problem is that FM radio has 200khz channel spacing and the weather band has 25khz channel spacing. The tuner is light years away from having the required selectivity to pick up several weather stations. In my area, on my OTHER weather radio, I get 1 very strong and 2 weaker weather stations. On THIS radio I just get the 1 strong station on 4 seperate channels(weakly). This is not a defect, as a couple of other reviewers have the same problem. I believe it is deceptive at best to say this radio has 10 weather channels. At worst it is just a plain lie. I gave it 4 stars because otherwise it is a decent radio, considering it is the size of a deck of cards. Just expect very very poor porformance on the weather band. If they didn't pull this stunt with the weather band, I probably would have called it a great little radio. I just don't like being deceived. Best money I've ever spent on a product like this! 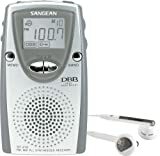 The ultimate pocket radio, Sangean's popular DT200V is imminently compact but loaded with convenient features, from its 19 station presets to its drift-free, PLL synthesized tuning, auto station scanning, TV sound reception, and handy belt clip. Listen through the built-in speaker or the supplied ear bud headphones. Forgot to turn it off? No worries: it shuts itself off after 60 minutes to conserve batteries (its sole source of power). The radio's high-impact ABS case virtually guarantees long life. Batteries should last 30 to 40 hours at moderate volume through the unit's single speaker and slightly longer on the included ear bud headphones. Pocket use was taken into account even at the level of ear bud manufacture: if you put your radio in your pocket, it's less distance to one ear than to the other, so one side of the headphone cord is accordingly shorter. The DT200V runs on 2 AA batteries, not included. This is my second of this model I have owned. I bought the first one at radio shack many years ago. I was afraid that I wasn't going to be able to replace it and was glad to see Amazon was carrying it. It performs all functions well. The first one I had lasted for years and was put thru a lot of abuse. I even had the on/off control repaired at radio shack. The earbud connector is worn out on the first one from thousands times of removing the buds. Besides function and size the most important feature to me is that it uses AA batteries. This size battery will last for may hours vs. another radio I had that used AAA batteries. I stay away from any electronic that uses AAA batteries, thay just don't last. 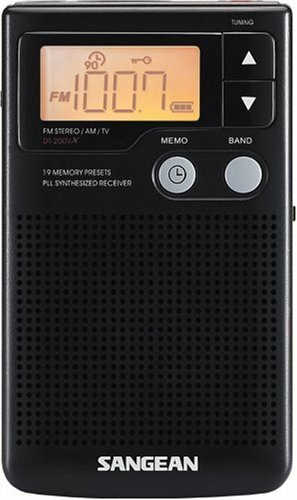 I've been hunting for a long time---looking for a pocket-sized radio to take along on long walks, and which would allow me to receive our local PBS FM station, KPBS, which has a notoriously weak signal where we live. The Sangean has the best reception of any I've tried. True, there are isolated 'drop-out' spots due to buildings, topography, etc, but in general I get good, strong, listenable reception. I'm very impressed with the features and apparent quality. Easy to use, quick to get started, but complex enough for the shortwave radio aficionado, the compact Sangean ATS-909 is a terrific travel radio adaptable for use anywhere in the world, receiving FM/MW, long-wave, and shortwave signals. You can set radio frequencies using five methods, including automatically or manually through a keypad or rotary dialing. The digital clock can be fixed to local and world times and provides both an alarm and a sleep timer. You can set the radio so you can fall asleep to music and later be awakened with news, music, or the buzzing alarm. You can also set three different wake-up times, each to a different frequency. This substantial and attractively designed unit also includes a long, retractable antenna for FM/SW and an internal antenna for good reception on medium- and long-wave bands. Tuning can be accomplished in a variety of ways; auto-tune, which scans all radio frequencies and presets your stations to the strongest signals; simple direct tuning to the desired frequency; or manual tuning with the rotary knob. The rotary tuning is quick, direct, and to us, the most effective method for finding and refining reception. An impressive internal memory holds up to 306 radio frequencies, saving you time searching. The best shortwave portable on the market!!!! 1. RDS. This great feature automatically displays the call letters of many FM stations. Not every FM station uses RDS, but nearly half of the stations in Greater Los Angeles do transmit RDS on their subcarrier. If they don't, you can manually enter your own display of the call letters. 2. 306 memory presets - with virtually every popular shortwave station already pre-programmed with name of country. Wow! What an easy way to get started in shortwave. 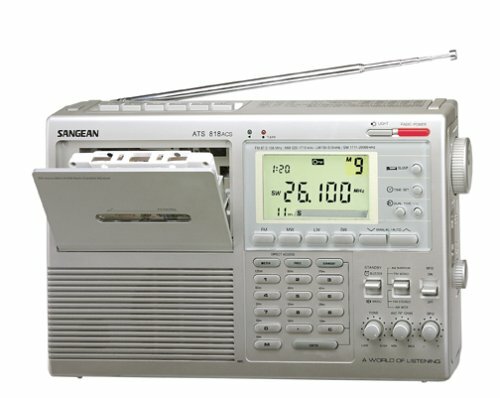 The Sangean ATS-909 is not the be-all and end-all compact shortwave radio. Grundig YB-400 has good sound and is easy to use, but I do not find them to be as durable as Sony products. The Sony ICF-SW7600G or ICF-SW7600GR is well made with synchronous sideband to partially overcome fading. It does help , but it doesn't solve the problem completely. Every shortwave radio has its strengths and weaknesses; that's why I have bought so many. But I am thrilled with the LCD display of station call letters and the many shortwave presets that you will not find anywhere but in the ATS-909. THE BEST SHORTWAVE RADIO EVER FOR THE MONEY !!! I own all the others, Kenwood, Grundig, etc. but SANGEAN ROCKS. I own 3 of these ATS-909's and I love everything about it: the layout of the buttons and knobs, the display is FANTASTIC, and the sound is AWESOME. For the money, you get it all. If you don't like the factory presets of all the SW Frequencies, program it the way YOU want it. The RDS is great! You can lable the stations with the call sign or whatever you like. Buy it, use it, learn to operate it like a pro, and you with respect this radio for the rest of your life. I have purchased this in the UK and find the radio to be very disappointing. It is reasonably sensitive on am and fm both shortwave and elsewhere. I could notice distortion on fades on the speaker. I also found that the quality for recording was far too bassy even with the tone adjustment to music and the band selection to wide. The quality from line output does not match the sound on the speaker. The switches on the side for tone, stereo to mono are only very thin plastic. The battery cover is small and flimsy as is the stand. Spend your money on a Sony 7600G or 100E. I realise now why people who buy the Roberts equivalent say it is a Sanean in wolf's clothing. I wish I had heeded advice on the web before buying. Do you want to spend this much money on a radio? It all depends on what features you want. This has RDS - the digital display that receives data from FM radio signals and puts it on the lcd display. Half of the FM stations in my area send out these signals (and all will eventually). Two stations even send out song titles and group names when a song is playing so that both are displayed in a running marquee on the radio screen. This is a fantastic option! And it was the first radio under 300$ to have this. Alphanumeric labeling allows you to put an 8 item name to any station you store in memory - you can put the call letters, type of music, DJ name, etc. It is done easily via the rotary knob that allows you to scan through the alphabet. The lcd display is quite large for a portable. Over 300 memory presets are possible. While there are presets for plenty of pages for countries, some of these presets are no longer used so you may have to reprogram them with new frequencies. All you do is rewrite over the old ones as noted in the manual. World time exists for most any major city and you can actually write in you own city's name on the screen digitally - a great little feature that is just plain neat. SSb is sensitive enough for me to pick up at least one armed forces network radio frequency. The green backlight is more than adequate. It comes with a carry case, adaptor, 60 foot windup sw antennae. There are so many other features on this radio that you could spend days exploring all it can do and personalizing it to your own tastes. The Sangean is a bit bigger and I wish the Sangean had a carry strap or handle. Having either would be a worthy improvement. Display: Grundig loses and Sangean wins. Sensitivity to sw frequencies: about equal. A tie. Presets: Sangean's 306 wins hands down to Grundig's 40. Power drainage: The Sangean uses AA batteries and you may need to change them more often than the Grundig's C batteries. Do what I do: buy a recharger and a couple of NIMH rechargeable batteries and you will always have batteries and will also save several hundred dollars in the long run. Timers: Sangean has three separate timers. SSB: Sangean leaves Grundig in the dust on this one. Weighing a mere 3.9 ounces, the DT-210V is small enough to fit in a shirt or jacket pocket and powerful enough to deliver TV audio (channels 2 to 13) and PLL-synthesized AM/FM stereo radio. A built-in speaker affords headphones-free listening, and 90-minute auto shut-off lets you fall asleep to the radio without fear of waking up to dead batteries. This is the perfect little radio, folks. It is small and sleek, with nice features. The reception is VERY good. In fact, I have not been able to listen to my favorite radio program for a year, since I moved last year from the town that it is broadcast from 50 miles south of my new home. Now I am able to pick up the station (although I have to angle the radio just in the right place in the house). No other radio since has been able to do that. You can even listen to local television broadcasts. The local television stations are extremely clear. Great features on this slick little radio. I especially LOVE the little speaker on the front. It sounds fantastic! Great little digital display on front. Deep Base Boost (DBB) sounds fantastic. I guess if there is one thing that I could say would have been a bit of an improvement would be to have a backlight on the digital display. But I'm not complaining. I love this radio!! This obviously was a very well thought out radio by Sangeans. It has everything I was looking for in a pocket sized radio! I am tempted to order another one. I had my eye on this radio for a few days and purchased it when it came up as a Gold Box Special. I'm very glad I did. This little radio does a great job, especially for AM purposes, where my favorite newsradio stations are. I had no trouble tuning in on my favorite stations (AM and FM) including one station that broadcasts from Tampa, FL that I'm able to pull in from the opposite coast. The TV does quite well, but my area only uses 3 or 4 channels within the 2 to 13 range, so I hardly use that band area. The only surprise (for me) came with the needed use of an antenna for the FM and TV stations. Normally, the wire for the ear buds works as the antenna, but if you use the on-board speaker (which works great) you'll need to use the included antenna wire which plugs into the ear bud jack. But that's not a big overall deal. The first day I used it I accidently dropped it on the brick floor with no ill effects. One battery popped out from the impact. It still works fine - just a few tiny nicks in the front. I'm glad I didn't buy a cheaper radio, which is what I had originally set out to do. I like this radio. It's easy to handle, it's already taken a beating, and it works really nice. I look forward to using it for years to come. Watch Out For A Very Serious Flaw!!! to return this radio as I write this review. My disappointment concerns the method of using the memory presets. preset tuning as the default or allow you to select that default. manual tuning or memory preset tuning. until Sangean corrects the problem). Looks great, feels great, but couldn't pull in FM public radio stations from my workplace or home in Seattle. Reception in Seattle can be tough and reading other reviews I thought this radio could do it. Wrong. I couldn't tell that it could pull in stations any better than any small portable radio. But it sure is good looking! After about 4 months, the power switch stopped working. I contacted Sangean and they replaced it for free. That's great service. During the time I was without it, I realize how much I missed it. The reception is great, the sound is good, and the size let's me take it around the house. I know that this radio costs a little more but I feel it is well worth the price. The BEST thing about the CCradio, is that the digital AM tuning is in 1 Khz steps (not the typical 10 Khz steps) which means, with other digital radios, each step in tuning will go like: 870, 890, 900, 910 etc. But with the CCradio, you can tune: 870, 871, 872, 873, etc. Since there are no other stations there, why is this great? Because, if say, you want to listen to 890 AM, if you tune to 891 or 892, you will hear the same station, but it will sound better with more highs, closer to the sound of an FM station. Plus, if there is another station close to the frequency you want to listen to, you can tune more to the side away from the offending station. This radio is marketed and hyped for the best AM reception, so I didn't expect much with the FM side, but I was pleasantly surprised! The FM side is great for distant stations as well. If you leave the backlight on for a few hours, some of the LCD display segments go out and look like it is broken. Turning off the backlight, after a while they come back and work again. You can still tune the radio, but it looks weird when this problem occurs, so I turn on the backlight, tune in the stations, then turn the backlight off again. Also, sometimes if you hit the preset buttons on the top, you will sometimes activate the clock setting or timer for some reason, even though you are not touching those buttons at all. This doesn't happen often, and overall this is a really great radio to have, it has TV audio as well, so you can watch TV in the bedroom but have the sound come out of your CCradio at your bedside instead of from across the room. It has weather band too. And an alarm clock, so it makes a great bedside radio, although it is hard to find the sleep timers and backlight buttons in the dark. I recently replaced this radio at my bedside with the Boston Acoustics Receptor which I like a lot better as a bedside radio than the CCradio. However, I would never get rid of the CCradio, nothing else tunes in 1 Khz steps for AM. Seperate Bass and Treble controls are nice, but although they say the radio was designed for optimal sound for the "human voice", I find I need to turn up both the treble and bass controls to maximum to get the BEST sound out of this radio, for voice OR music. But that is usually the case for any radio with tone controls. I find the price is a bit high for this radio. Short and to the point. No complaints with the AM reception. Not that it matters, as someone plopping down $150 for AM radio wont really care, the FM/Weather band reception is absolutely deplorable. Think clock radios are inherently boring? Think again. Sangean's RS-330, looking very much like a run-of-the-mill night-table fixture, is actually a compact and unusually well-designed dual-alarm clock radio with--no kidding--decent sound quality. Separate bass and treble controls let you tailor the sound quality while the auxiliary audio input and output offer flexibility in sound sources. Conveniently, the RS-330's radio sets its own presets (12 FM and 12 AM) using Sangean's Auto-Program Setting (APS) feature, and reconfiguring those presets is a simple operation. Unfortunately, there are only six preset buttons, requiring a two-step process (and the equivalent of a shift key) to access presets 7 through 12 in either the FM or AM band. Sangean supplies an FM antenna, but we found the radio offered good reception even without it (though performance will vary with locale). A large side knob handles volume adjustments (including balanced adjustments through the RS-332, if you wish). Individual bass and treble controls--rare beasts in the jungle of clock radios--rest below. You can crank the bass and treble to keep the frequency extremes from being lost at quiet listening levels, or you can reduce the bass output for more natural sound at higher listening levels. The speaker will distort if you turn the volume too high with the bass maxed. Clock settings are a cinch, as the RS-330 uses a single button (just out of accidental reach) to toggle through the main clock time and the settings for alarms 1 and 2. You can set each alarm for either radio or beeper, and each alarm gets its own volume knob on the back panel. The alarm levels function independently of the master radio level, whether you've selected the radio or the beeper for your alarm. This brings a certain freedom in listening--you never have to worry about whether you've left the volume too loud or too quiet for the next day's wake-up. For nighttime lullabies, the RS-330 offers a Sleep function. The default setting is one hour, but you can set it anywhere from one minute up to six hours by hitting Sleep and adjusting the duration with the tuning (up/down) buttons. Conversely, you can set a countdown timer for up to six hours using a Timer button. The beeper, but not the radio, sounds at the end of the countdown. You even get to choose separate stations to fall asleep and wake up to, though both alarms must wake to the same radio station since the radio-alarm defaults to preset 1 of your last-auditioned band (FM or AM). (Linking with the RS-332 permits additional and differing presets.) The snooze bar, which gives you five minutes of sleepy reprieve with every smack, is easy to hit and appropriately wide. 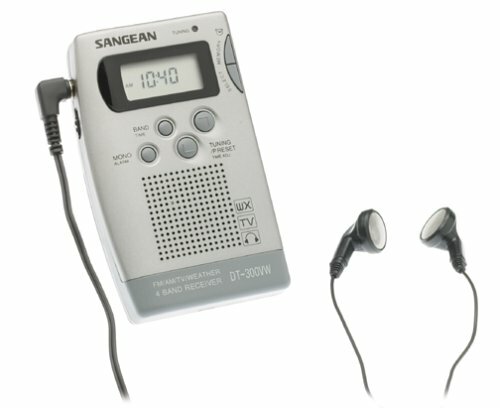 A wonderful touch is Sangean's inclusion of an auxiliary audio input and output (both 0.125-inch stereo mini jacks), which lets you use the RS-330 as an amplifier/speaker for a CD player or a cassette deck (through the input) and as a facilitating hookup with an integrated amplifier, or a cassette or minidisc recorder (through the output). My goal was this: I wanted a quality digital alarm clock that would provide 2 alarms, battery backup and a clean appearance. Functionally, the 330 meets and exceeds those criteria in it's solid construction, unexpected warmth of sound, digital tuning (I live in a suburban area and had to use the antenna to recieve all of my stations), and handsome appearance. The built-in capactitor precludes the need for a battery and eliminates that maintenance issue. The quality of the sound also means that I can actually listen to the 330 as a radio - something I've never done with tinny-sounding clock radios. Independant volume adjustement for the alarms enhances this functionality, because the alarm volumes stay constant irrespective of the volume setting used for regular listening. I've found the display to have good visibility characteristics, displaying both current time and wake up time. The blue on black looks great and is an improvement of the RED of my last unit. Self adjusting to the relative light in the room, the output is never overpowering, but can be adjusted for those wanting a brighter output. The snooze bar is nice and wide, and sits away from all the other buttons. I would like to have seen a user-programmable snooze duration, but alas, not. The snooze duration is 5 minutes. There are a couple of features that I do not like. First, the alarm radio automatically defaults to preset#1 of the last band (AM or FM) listened to - meaning that I have to change the presets if I want to change the wake-up station - so there's a minor flexibility issue. Second, the Antenna is a long wirey thingies that I had to route down beneath my baseboard heater to conceal it - not a major problem but a minor bummer. I have not experienced any problem with hum, as reported by some others reviews, and overall I'm real pleased with the 330 and reccomend it strongly. I like the sound of the radio and the FM reception is very good but that is all that I like about it. I have also found that my 330 hums, this is most annoying in a quiet bedroom. The super capacitor memory backup isn't super at all! Living in a rural setting where power outages are frequent has revealed a serious flaw in this radio, power failures of less than a minute cause the RS330 to forget all tuner presets and clock settings. When power returns the radio tunes itself to whatever station it feels like and comes on loud, not a pleasant experience in the middle of the night. This radio can not be depended upon for reliable alarms and is an annoying product to live with. The radio didn't turn on when I plugged it in. Pressing the reset button didn't seem to help. Persistence helped by inserting the plug several times. I had trouble programming the tuning buttons for preset stations. The instructions do not state that the preset buttons must be held for more than an instant. Persistence paid off---I tried over and over. 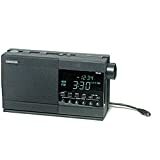 If a person has been humbled by years of computer problems, he can deal with the the Sangean RS-330 clock radio. But I wouldn't recommend it as a gift to someone who is not computer literate. I recall the clock radios of the 1960s, which were fitted with levers as sleep switches. If you were still awake at the end of sixty minutes, you could pull the lever again without turning on the light or consulting a manual. And the simplicity of turning a knob to change stations---priceless. We'd been looking for a new clock radio and the retailers all seemed to have only cheap, tinny-sounding plastic contraptions available. Eventually, a little research led us to the Sangean RS-330. The reviews were mostly favorable and it was priced nicely, so we ordered it. The first thing we noticed was its size - it is definitely not compact, though the description says it is (it measures 11.5 x 6 x 3 inches). Also noticed was the somewhat confusing array of knobs, switches and buttons on the front, top back and bottom of the unit. Upon plugging it in, we noticed nothing. No clock, no sound, nothing. A quick perusal of the user guide revealed that there was a Reset button (one of those buttons on the bottom) that needed pushed. The RS-330 came to life, scanning through all the available stations in the area. We were pleased to note that it had much better sound than any other clock radio we've owned. Setting the time and assigning stations to the memory buttons was easy, once we understood the layout of the controls. So far, so good. The real test would be how it operated as an alarm clock. After the first night's test, a few things were noticeable: the time display was very bright, the gradual wake-up volume feature is not all it's cracked up to be, and the RS-330 has a definite "hum". The first two items were easily remedied. I adjusted the display brightness to its lowest setting though it is still too bright for my taste (and the adjustment knob requires a screwdriver and is on the bottom of the unit) and adjusted the volume level, which has nothing to do with the actual volume control. The hum is there but doesn't bother me. My concern now, however, is that the unit failed after about 40 days of use. The lights are on, but no one is home - no radio, no alarm. Hopefully, the replacement will last longer, but I am disturbed that I will have to pay shipping and send Sangean $8 for a replacement. I can't recommend the RS-330. For those of us who don't like to be without news and music when we travel, the Sangean ATS 606AP compact stereo receiver is the ideal companion. The unit receives AM/FM, long-wave, and shortwave signals (frequency ranges from 153 to 29,995 kHz and 87.5 to 108 MHz), and frequencies can be set either automatically or manually through the keypad. One of the things that make the ATS 606AP such a terrific travel radio is that it's adaptable for use anywhere in the world. The digital clock can be set to any two time zones, and the unit provides both an alarm and sleep timer. You can set the radio to automatically turn off so that you fall asleep to music and then later gently awaken you with news, music, or the alarm. The auto-tune feature scans all available radio frequencies and presets the stations to the strongest FM/AM or long-wave signal. An internal memory can hold up to 54 radio frequencies, saving you time searching for your favorites. You can refine the tuning with the manual control. Our reception on FM/AM bands was very good, but shortwave yielded only one interference-ridden station, and we were unable to tune in any long-wave at all. The LCD shows the current station, frequency, local time, memory location, and the status of the alarms and all other functions. A small light in the display window switches on for viewing the display in the dark. Sangean WOW what a radio!! I am a radio nut. I even have one in the shower. I needed a radio to replace my Sony SW-1. I live in the California central valley between Fresno and Bakersfield, the radio reception here is horrible and I like to go to sleep with the radio on and ear plugs in. With my Sony I could get fair Am/Fm and SW. With the Sangean I get great Am/Fm and SW. I get stations on the Sangean that were nothing but static on the Sony. It's a little bigger than my Sony but has some great features the sony didn't. Like setting the length of time before it turns off and the auto station select (I used it for FM, I like all kinds of music). The handy display light that turns off after 30 seconds. And to pull in those weak stations, a simple button to change to the fine tune mode. Also handy is the lock button that locks the front pannel (It keeps me from changing the station by bumping the buttons while falling asleep) If you don't mind a big radio and want one for AM get a CC radio. If you want a small radio to travel with or a small radio for your night stand, this is the best for the price. Pros: Great reception, easy to use, small, comes with a nice leather case, ear plugs, external antenna and ac adapter. Above all if you are SW listener, I don't think this radio help you much. And to spent $... for only good on FM/AM, not practical to me. But if you don't mind above your pocket and all the issues listed in " CONS " this stylish radio is a good start. I would give this radio 4 stars. I have owned this particular model of Sangean, as well as several others, for a number of years. Sangean radios, in my experience, have excellent sound (for their size), have great reception, and are quite easy to use. I listen to classical music, international news, and domestic news while at my home in radio/tv/cellphone no-mans land. Only the Sangeans work up here. Our pretty little Grundig Porsche radio has to live at the city house to be useful. Back to the 606 - the metal and plastic case of the 606 is quite solid, handsome, and compact. The built-in stand is both very convenient and angles the radio perfectly for easy viewing of the LCD at counter/table/desk height. The sound quality is terrific, considering it is a single driver of maybe 2.5". Sound is full, dynamic, lively, remarkably rich, and very fast. Bass is lacking, as you would expect over a radio with such a small driver. The 606 has one nasty habit, which is that if you plug it in, and it has batteries in it, it will drain the batteries instead of using the wall power. You must take the batteries out of it before it will use the AC. Mine is a fairly early one (it uses the european power adapter with a US adapter on it), so this may have been fixed. As mantioned, this is my 6th or so Sangean, and the whole line is well built (except perhaps the 322) and they all sound great. I highly recommend them all. I bought and returned this item. Very poor quality and all parts seemed cheap. I was searching for a radio that was more sensitive than the previous radios I had been using, not only on the FM band, but also on the AM band. The FM band receives like my car stereo does. It picks up about every station I would want to listen to and a few others I couldn't pick up from within my house. The AM band is sensitive, but being that I live in a rural area, I suspect it will be even better when I travel with it. The TV band also picks up very clear. The radio has simple controls and is designed to be easy to use. The backlight comes in handy if you like to listen in bed. The retracable ear phones are adequate and help reception on AM stations. All in all, this was a great buy I would recommend to anyone. The holy grail of pocket radios! Wow! This is what I have been looking for! A pocket radio with the following features: good reception, digital tuning, light, alarm, clock, presets, good speaker sound, fits in my pocket, has built in earbuds (that retract with a push of a button! ), stereo FM when you use the earbuds (or your own headphones), lock switch, TV audio, built in telescoping antenna, auto turn off after 90 minutes (which you can easily cancel). This is a great radio, the best pocket radio with a built in speaker that I have seen. Sangean usually has terrible reception and their radios usually have a lot of noise between stations but this one receives and selects as well as my Sony! Definitely get this if you want apocket radio with a speaker! Since receiving my Sangean220V radio, I hate going anywhere without it, even into the next room! I love knowing I can flip it on to keep me company whenever I get bored or things too quiet. I don't want to damage the earbuds, so I leave them retracted and use a separate headset when I'm not using the speaker. Reception is great on this little dude, and I got an AC Adapter at Radio Shack so the radio can keep me company by playing all night. I spent some time with the manual, and as a result am able to pretty much do the controls in the dark! It does have a display light, a clock and an alarm, but I don't really use those. I just love having a little radio I can tune easily using the digital tuning, and listen to without having to plug up my ears. It's small and easy to take along. I love it, and want a spare! Design and ease of use are excellent. You can literally hit the Band button to go from Fm to TV to Am. Presets were cake to program. With the exception of setting the alarm and the clock, most buttons have only one function. This avoids those nerve-racking instructionsi.e. hold this while pushing that, hit the button three times and then hit function twice. For those who have a burgeoning interest in shortwave radio or who don't like to be without news and music when traveling, the Sangean SG-622 10-band portable receiver makes an ideal travel companion. Small enough to slip into a jacket pocket but powerful enough so you can stay in touch with the world, you'll barely need to glance at the operating instructions before you'll be up and running with this nifty little device. Solid and compact, the SG-622 includes just the essentials: a retractable antenna, volume and tuning knobs, and a wide face displaying the bands and frequencies. Tuning is accomplished by clicking a switch to the appropriate band, then dialing up or down, refining the tuning by hand as you go. The all-inclusive frequency display results in imprecise indications, so it is not possible to determine exactly which frequency you are tuning in. But our reception in all bands on any strong signal was excellent. Overall, we found this a sensitive radio with great portability that would make great introductory piece for anyone interested in shortwave radio listening. The Sangean SG-622 is powered by 3 AA batteries, but consider adding an AC adapter to reduce your battery expense. It comes with a one-year warranty on parts and labor. It's hard to believe that you can purchase so much performance for less than $40. This little radio has the ability to fill a large room with undistorted sound from any of its 12 bands. Moreover, it is quite easy to use. Sensitivity and voice clarity are remarkable. The automatic gain control deals nicely with weak and strong signals. Selectivity is quite good, but one could use a larger tuning knob (or I suppose in my case, smaller fingers) to make those fine adjustments easier. The size of the radio makes it easy to pack. Although you get a lot of radio for a few dollars, it would have been nice if Sangean had included an AC adaptor. I have used this radio a lot since I purchased it, and it does have a hardy appetite for batteries when played at high volume. Accordingly, I purchased an AC adaptor for it. I tried several adaptors before I settled on the Radio Shack 4.5 volt "International" model (cat. no. 273-1759). This device accepts almost any input voltage and frequency and produces a full amp of filtered, regulated DC. Unlike other adaptors I tried, this one is relatively "quiet." It does not induce hum or electrical noise. Best of all, it folds up in a very small travel package. If you don't want to spend a lot of cash on a multi band radio, but want to be able to listen to stations wherever you may travel, the SG622 should work well for you. Actually, I own the clone of Sangean SG-622, the Radioshack DX-397, and I love it. It is a simple inexpensive and Spartan short-wave radio, but it does a very good job in pulling out the main short-wave stations. It does not have bells and whistles like, digital tunning and display, it does not have an auto power shut off or an alarm clock either. It is fully analog, but for me the most important is sensitivity, selectivity and the sound quality. All these are much better than in a lot of more expensive radios that I have seen. Compared side by side with a Sony ICF-2010 that I own, it pulled out almost all the main stations that the Sony could get, with a tenth of its price. It is lightweight and the sound is very good for a 3inch size speaker. It may be some interference from nearby strong stations, but it can be reduced with the orientation of the receiver. I could never belive that you could get such a good quality short-wave radio with such a low price. I give it a wholeheartedly 5 stars. I have wanted a shortwave radio for quite sometime. But,was unwilling to pay the high prices for a digital one. This little compact receiver is everything I'd hoped it would be and more. It picks up all of my favorite am/fm stations and shortwave stations.Better than some other larger radios I have. I only wish I would have found it sooner. Don't waste your money, all I get is STATIC both indoors and outdoors. The AM and FM work fine, but that's it. Don't expect much from unit. If you want a TRUE short wave receiver, buy a Grundig or Sony. Very nice radio, good price. I purchased this radio after buying and using a Grundig G-2000A for about a year. The Sangean is a little larger, with perhaps a three inch speaker versus a two inch speaker for the Grundig. The Grundig has only moderately good sound quality for AM and FM. This Sangean has surprisingly good sound quality on AM and FM, particularly for a radio this size. I put it in our kitchen, and when someone is down there playing it I noticed that I can hear it upstairs and the sound is really like a much bigger radio with a larger speaker. The sound is clear and has very good tonal quality and richness. This Sangean has settings for both music and voice programs. Tuning and reception are also good. The Grundig is kind of a battery hog, that will run down in around three weeks with moderate use. The Sangean has better battery life with similar use, although I think using the shortwave bands seems to be a greater drain on the batteries of both radios. If you haven't used a shortwave radio before be prepared for a booming and fading pattern of the sound. Both radios have this quality, and it is a characteristic of shortwave transmission. You are likely to find that this will detract from your listening satisfaction with some programs, but again, I would have to give the nod to the Sangean for overall quality on the shortwave tuning and sound. With either radio you certainly can listen to some stations you have never heard on AM and FM. I was listening to a station in Florida one night and then when I changed channels some, I was surprised to find that a Cuban station was coming in pretty clearly. The Sangean also has a small light that changes color to help you determine the strength of radio signals as you adjust the tuning knob to find stations. 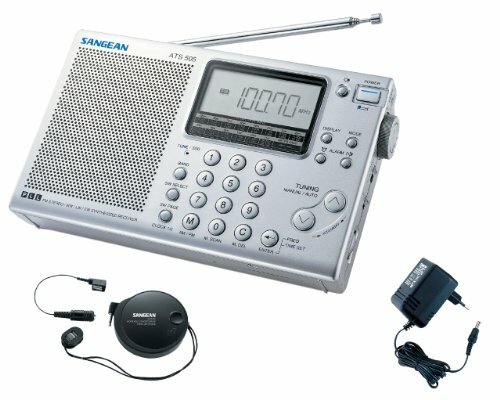 This Sangean is quite a nice radio, and I think most radio fans will like it. I like my Sangean ATS-505P very much. For such a small radio it packs alot of features in its price range. It has very good frequency reception in all bands; good speaker quality; easy to use controls and buttons and excellent battery life. You do need to know when and where to use the radio in shortwave mode(this is not the radio's fault). Shortwave does have idiosyncrasies that are not found in AM and FM. If you are really in to shortwave radio, this radio probably isn't for you. If you are just trying shortwave radio for fun, you won't be disappointed in this model. 6. there is a discernable (1-second) delay when entering digits in the direct-access keypad - you'll need to get used to the delay, and the keys require more pressure than you'd expect for a keypad.. If you've never had the delight of carrying a little transistor radio in your pocket, you will be surprised by the pleasure derived from the Sangean DT-110 digital AM/FM stereo receiver. It weighs less than 5 ounces, well beneath the range of possibility for CD or cassette players, and it packs numerous features, including auto-scan, auto-preset, and one-touch recall of your preset stations. A lock mode even prevents accidental changes to the tuner's setting. To use the unit, just pop in a couple of AAA batteries, flip the unlock switch, and turn it on. The cord connecting the earphone to the receiver acts as an antenna for FM reception, and a built-in antenna assists with AM reception. You can improve AM reception by rotating the unit. The hard earphones take a bit of getting used to, and different cord lengths for the left and right ears left us a bit mystified. On live broadcasts we found that the mono/stereo button improved sound by reducing audience noise. (Mono is usually designed to improve reception on weaker FM stations.) The Deep Bass Booster (DBB) is prominently featured on the receiver's packaging, but we found it did little to improve the sound. Still, the receiver offered surprisingly good listening with or without the bass booster. Manual tuning of the DT-110 is easy, and storing favorite stations in memory is intuitive. The volume control is a dainty wheel requiring subtle movements to adjust. With the operator's guide, you'll find a thorough directory to all the features, and in just a few minutes you can set your 15 favorite stations and be on your way. This is an excellent quality radio at a great price. Its FM section is equal to a high-quality stereo tuner. AM reception is very good--it can really pull in distant stations! It does not have a speaker so you do need to use headphones or to connect an exterior speaker. Highly recommended. I am very pleased with my unit. This durable, amazing, practical, great-sounding radio has been with me non-stop for several months now, tagging along with me in my shirt pocket, coat pocket, jacket pocket, PANTS pocket, strapped to my belt, tied to my sleeve, dangling into a bag, clutched in my hand or just laying near me. I've worn out a dozen pairs of headphones along the way (in case you think I'm super-careful or anything), but the radio is totally unscathed. It's the greatest. It fits in my pocket, has amazing sound quality, and is every bit as good as it was on the day I bought it. It's amazing how such a magnificent piece of electronic engineering can be rendered so user-unfriendly by poor interface design. I like the small size and excellent sound quality, but a few aspects of the ergonomics could be improved. For example, I like to switch rapidly between pre-set stations (as soon as a noisy commercial comes on, for example). This requires pressing two buttons instead of one -- as all of my previous el-cheapo walkmen could do easily -- so I'm a bit annoyed at that. The work-around is to use the "priority" settings, but it's limited to only 3. Yet I could live with that if only it functioned properly. I bought one and had to exchange it because the low-battery indicator didn't work. They sent me a new one and it had the SAME PROBLEM. Guess it must be a design flaw. So I simply have to accept the fact that it'll suddenly stop working without any warning whenever the batteries run out. But I thought "no way, that can't be true" so I contacted Sangean. They told me that the battery indicator light is only there to let you know that you've just removed the batteries (DUH!) and should replace them soon before the station settings disappear! Hey, tell me something I don't know, like the fact that the existing batteries are weak! When I told the Sangean guy that every single battery indicator in every single product I have ever owned was there to tell me that it's time to replace the batteries (and not a "reminder" that I just did so a second ago), he shrugged as if I were nuts. Second, I figured out that they must have made the left earpiece chord shorter so that you could easily tell them apart while running without having to read the fine print; however, they don't do anything to let you increase the slack on the chords (by sliding the wires apart), so the left side keeps popping out of my ear whenever I turn my head! The work-around, of course, is to go out and buy a 2-dollar pair of headphones and use that instead. When I asked him if Sangean intended to address any of these problems in the next model, he said "no, but we'll be making it in lots of choices of colors!" Ah, so good to see that they have their priorities sorted out. Ahem. Guess I'll keep this because I'm not finding anything better out there, and frankly, it does sound great. I love this radio...except for the uncushioned earbud headphones. I especially like the 90 min. cutoff, I use my radio at work everyday and sometimes in my rush to leave I forget to turn it off. The sound quality is excellent. Makes my workday go by much faster having great reception to pick up my favorite radio stations. This radio is great. Exceeded my expectations. Strong AM reception (talk radio for me). This is the best tiny radio I know of. I've tried others that are built into headphones (too heavy!) or strap onto the wrist (sound & reception less good) or that sell for cheap at the drugstore (awful reception). From the suburbs it pulls in the NPR station just fine (some small radios don't). I like that the tuner is analog, not digital. In my experience, the cheap digital tuners in other small radios cut in and out annoyingly on marginal stations. Sounds great with better headphones (I use Grado SR80). This portable radio/cassette recorder is a short-wave enthusiast's dream, offering FM, AM, and short-wave radio reception (all short-wave bands from 120 to 11 meters), as well as a built-in cassette recorder that can be programmed to record specific stations at specific times. The ATS-818ACS also features a beat-frequency oscillator for single sideband (SSB) and continuous wave (CW) (i.e., Morse code) reception--broadcasting methods often employed by amateur radio practitioners. This is a dual-conversion receiver, meaning it passes the incoming signals through two intermediate stages to eliminate interference and more precisely select its incoming channels. It has five tuning methods: direct frequency input, auto scan, manual scan, memory recall, and rotary dial. The ATS-818ACS has 45 memory presets to help you hop to favorite stations in a jiffy. The receiver's output power is 800 mW, and it uses a single 3-inch, 4-ohm speaker. Wish I have gotten it sooner. I received my Sangean ATS-818ACS AM/FM/SW Receiver from Amazon.com in two days with the book Passport to World Band Radio, 2003 which is a must for anyone just starting out like me. In virtually five minutes I picked up the BBC and a broadcast from China. This is unquestionably the best radio I ever owned. I recently moved to a heavy populated district that is enclosed by trees so it has been difficult to tune in all the stations in my FM listening zone with my conventional radios. I tried XM Satellite radio but although they pride themselves with their 100 channels of variety after awhile I felt like I was being programmed by another conglomerate like Clear Channel plus there is a monthly fee to continue XM. With my Sangean I can receive at least 50 times more stations then XM and a better variety of music, news and different opinions from around the globe. I am new to the world of Short Wave and even if I don't use it often for the price I paid and the fact that I can get all my FM Stations to come in clear makes it worth the money. Since short wave has endless possibilities my next purchase will probably be the Grundig 800 Millennium or a model by Drake. If Amazon has the Sangean ATS-818ACS on sale again pick it up it will lead you out The Matrix. This radio was a replacement for a Thomas Radio. With Television being a medium that is starting to become mundane we were looking for a new form of entertainment. We decided to revert back to radio ( talk / Variety ) and this radio fit the bill. I am very pleased with the ease of use and the reception on the shortwave band ( I am a novice ). Contrary to some reviews I found the sound quality very good. The tape recorder is a plus if you have friends that doubt what you might have heard. Overall, this is a good value. One drawback was the owners manual. If you are a novice you,ll probably have to educate yourself to understand some of the terms. I have had this radio for over a year, and I like it a lot. But it did have the problem described in an earlier review, in that the LCD display failed after a year and the radio became unusable. Sangean USA replaced the radio even though it was out of warranty, which was great, but was also a indication that the radio has a recurrent problem. I am planning to buy another one, but wanted to assure that the problem would not recur. I emailed Sangean, and they acknowledged the problem in earlier production units. They say it has been fixed for later production units, so according to Sangean the design problem has been resolved. This radio looks great. I really liked the style. However, that's about all I really liked. Another reviewer compared the sound to the Bose Wave radio. Either they've never heard the Bose or they were just really happy with the price comparison. At high volumes the radio sounds ok but at lower volumes it sounds like it play from inside a cardboard box. I could live with that but my real disappointment was with the tuning. I live in the mountains where radio reception is difficult. Usually "PLL Synthesized Digital Tuning for rock stable reception of AM/FM" is exactly that. In this radio the tuning is stable but the reception was worse than other cheap dial tuning radios that I own. Often raising the antenna made the reception even worse. I really wanted to like this radio but it's just lacking in too many areas. The clock vs frequency display feature is another really bad idea. This radio is solid. The controls feel precise. The 1960-retro vertical styling makes it unusually handy to carry around as a portable. It has sound quality at least as good as any mono portable radio I've ever heard, and it provides stereo FM although, of course, only when you use headphones. Unusually, it also has selectivity and sensitivity to match its other strengths. It picks up weak and distant stations as it should (and as most radios unfortunately don't), making it useful in rural areas, while camping, and so on. It might not be quite as good as the GE Superadio III in this regard, but it's close, has some good features the GE doesn't, and it tunes much more easily. On the other hand, if you're REALLY out in the boonies, external antennas can help you catch the weakest signals; and while the GE has terminals for both AM and FM external antennas, the Q Radio has AM antenna jacks only. This is a radio with a clock, not a clock radio. 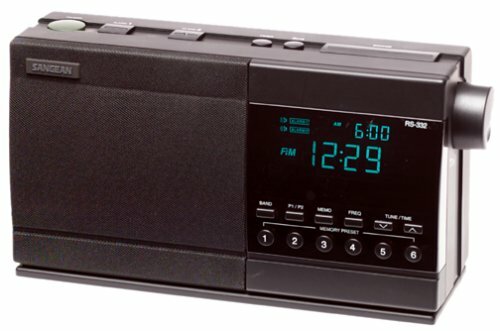 If you want to use it as a clock radio only, its display will disappoint you; it is angled upward, making it hard to see when it's at eye level as on a bedside table, and it can't show the radio frequency and the time at once. However, it does sound far better than any clock radio I've ever had. In special circumstances, the fact that the Q Radio will still wake you on time even if power fails, or is not available at all, may lead you to prefer it to the more usual clock radios. Although easy to operate, many of its controls have multiple functions. This can be slightly confusing at first. However, they're pretty thoroughly labeled, so you shouldn't have any trouble figuring them out. My Sangean Q arrived via Fedex within 7 days of placing the order. and the obvious assembly quality. The controls, large knobs and buttons, are very easy to see, feel, and manipulate. The backlighting glows a warm golden shade and can be turned off. The various buttons on top that control functions are designed to make their use intuitive - I set the radio up to my preferences, and then read the manual! Very simple and straight forward. Station reception is excellent, very important in rural east Texas. This quality, and the 5 pre-sets on each band, remind me of a car radio. The sound is pleasant and well balanced, a little weak on bass presence and separation, but considering the price and size, very adequate, and better than most other radios in this price range. 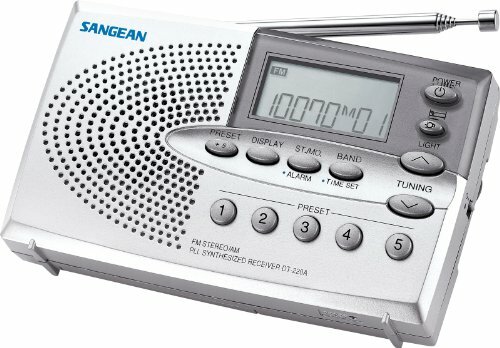 The Sangean Q is a fine, general purpose radio with above average convience features and sound. Keep the batteries fresh and you'll have a great emergency radio to boot! A lot of radio. Not so much clock. This would appear to be a car radio circuit put in an attractive, rather retro looking package. You get your five preset buttons, and the display is in a panel that looks like it would be at home in a dashboard as well as in the radio you're given. You get car radio performance out of the radio circuit as well. First night I got it, on the AM side on a spring night I got New Orleans, Toronto, and Cleveland. The FM circuit appears to be just as solid, giving good reception on stations that usually are not easy to hear on the radio it replaced. There's even a terminal to attach an external AM antenna to this thing; unfortunately there's no provision for an external FM antenna. The FM sound quality is solid, even though stereo can only be had through headphones. As a radio, this would be useful for sports fans and other AM listeners who follow teams in distant cities at night. The clock radio part is very basic, however, with only one clock or alarm setting. When the radio comes on, as noted below, the display shows the frequency instead of the time; you can't set up for a different display. There's no fancy stuff that allows you to fall asleep to one station and wake to another, or to adjust the sleep and wake volume to different settings. The only way you get a clock memory is to add the batteries that power the radio itself: four D cells. The whole package is rather heavy with the batteries in. Think clock radios are inherently boring? Think again. Sangean's RS-332 is a powered speaker and clock radio combo intended to complement Sangean's RS-330 clock radio. When used with the Sangean RS-330, this unit offers stereo sound and complete, dual-alarm, radio-wake-up freedom. The RS-332 is a model of clarity: its fluorescent blue display is large and intuitively laid out, its two alarms are easy to set, and its sound focuses though a single, natural-sounding speaker--identical in size and timbre to the speaker in the RS-330. Audio feeds to the RS-332 through a supplied 18.5-foot multipin cable, which also allows the RS-332 to serve as alarm 2 for a second sleeper in this dual-alarm system. (You can station one clock on either side of the bed.) Through the connection cable, the RS-332 can operate the RS-330, and vice versa. Conveniently, the RS-332's radio sets its own presets (12 FM and 12 AM) using Sangean's APS (Auto-Program Setting), and reconfiguring those presets is a simple operation. Unfortunately, there's only six preset buttons, requiring a two-step process (and the equivalent of a shift key) to access presets 7 through 12 in either the FM or AM band. Clock settings are a cinch, as the RS-332 uses a single button (just out of accidental reach) to toggle through the main clock time and the settings for alarms 1 and 2. Using the RS-330, you can set each alarm to wake with either radio or beeper, and the alarm for the RS-332 gets its own volume knob on the unit's back panel. The alarm level functions independently of the master radio level, whether you've selected the radio or the beeper for your alarm. This brings a certain freedom in listening--you never have to worry about whether you've left the volume too loud or too quiet for the next day's wake-up. For the alarm, the radio switches to mono reception, rather than stereo, so that the first alarm to go off will not disturb the person whose alarm is set to go off later. For radio listening, a large side knob handles volume adjustments; you control bass and treble from the Sangean RS-330. The RS-332 has a volume control switch on the back panel. When you switch this on, the master volume knobs for the RS-332 and RS-330 operate independently of one another--you must listen carefully to match the level for balanced stereo sound. When you switch the volume control off, however, the RS-330 controls the master level for both radios, though the alarm levels are still set independently. For nighttime lullabies, the RS-332 offers a Sleep function. The default setting is one hour, but you can set it anywhere from one minute to six hours by hitting Sleep and adjusting the duration with the tuning (up/down) buttons. Conversely, you can set a countdown timer for up to six hours using a Timer button. The beeper, but not the radio, sounds at the end of the countdown. You even get to choose different stations to fall asleep to and to wake up to, though both alarms must wake to the same radio station since the radio-alarm defaults to preset 1 of your last-auditioned band (FM or AM). (Linking with the RS-330 permits additional and differing presets.) The snooze bar, which gives you five minutes of sleepy reprieve with every smack, is easy to hit and appropriately wide. I've owned the set of Proton radio and slave speaker. The sound is incredible. I have placed them in my bookshelf headboard where they are a perfect fit of form and function. All the controls are extremely workable and well-thought out. But even better is the fact that you can set it and forget it. I awaken to my favorite station, with the music ramping slowly up. I got to sleep using the sleep timer. Depending on which alarm you set, 1 or 2, the sound comes out of different speakers. Here in Texas we get lots of bad storms yet I've rarely had to reprogram my Proton; it holds the settings when the power's off. I highly recommend this unit. The first one arrived and didn't work. The second didn't either. The fact that today there are only two reviews when last month there were a dozen makes me wonder. This is the speaker slave to the Proton RS-332. I keep the master unit in my bedroom as a clock radio. I wanted a radio in the little office next to my bedroom, but I have two computers in there and I liked to listen to an AM station. The AM reception was awful. What to do? I got this speaker unit and hooked it up with the 18' cord to the tuner in my bedroom. I hooked up a Turk AM Advantage antenna to the tuner. The speaker unit has full on/off tuner controls, but since the actual tuner is in the other room, the computer interference doesn't affect the AM reception. What a concept! Works great! 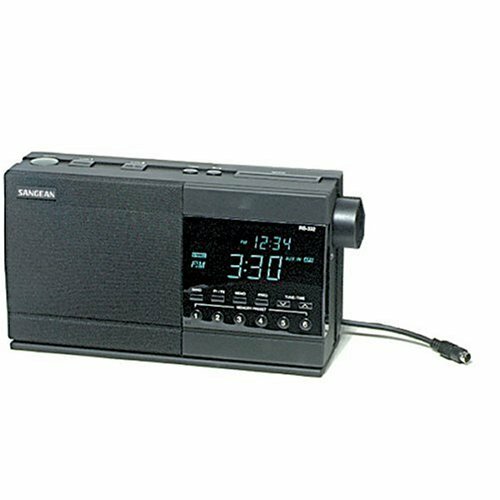 The Sangean ATS-404 digital AM/FM stereo receiver is a portableshortwave radio with a built-in digital clock. This radio can receive anexpanded number of radio frequencies, which makes it an ideal radio for eitherurban or rural use. The illuminated time display, which also includes seconds,can be set to show the time of day in either 12-hour (AM/PM) or 24-hour timeintervals. The alarm for this receiver has a repeating beep tone which increasesin volume once every 15 seconds, for up to 1 minute. The radio has an adjustablesleep timer and snooze control. The radio frequencies can be tuned in eitherautomatically or manually. The auto memory scan will run through and play eachpreset station for seven seconds. The auto preset system will hold up to 45frequencies in memory. This radio is very similar to a panasonic I purchased 7 years ago, though that one was $100 and had limited sw bands. For its price, this is an excellent deal. None of the information I could find prior to purchase explained the sw band range, which is 2.3 to 26.10 MHz, from 11M to 120M. I'm giving this radio a "4" on the basis that some die hard SW enthusiasts would probably prefer something similar to the more expensive models available from Sangean, Grundig, and others. For my purposes though, this radio is more than suitable. Radio Netherlands, Deutche Welle, BBC, Radio China, Russia, etc.. are all easily heard. Size overall is about 4" high, 6 or 7" wide and 1.5 deep. Light and easily portable for travel. Other details - has an alarm function, 9 am presets, 18 fm presets, and 18 fm presets. Also comes with "ear bud" head-phones and a nice case. A filter switch cuts out high end noise in the am and sw bands. Has a back illuminated light that can be turned on or off 7 seconds at a time. Has a stereo and mono switch for headphone use. An adaptor may be used instead of 4 AA batteries. Sound projected from a small 3" speaker, but the clarity is very good without distortion. Very good reception. In all this is a good way to own a quality SW radio. I was looking for a radio to bring to work with me. The am and fm stations I enjoy are adjacent to much stronger stations, and I was constantly having trouble picking up a clear signal on a conventional dial tuner radio, whether it was plug in or battery. When I got the Sangean ATS 404 digital radio, I was pleasantly surprised to hear how well it received the weaker-signal stations that I enjoy. Since I don't use the short-wave function, I can't review that aspect of the radio. The sound quality is quite good for the size of radio, the functions are easy to use after reading a poorly-written instruction manual. 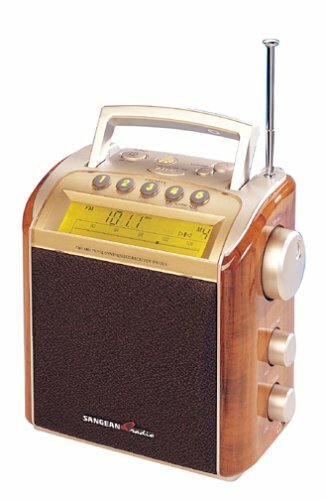 The main drawback with this radio is that it consumes batteries (4 AA's) rather quickly, after about 16-20 hours' worth of playing time. I've hooked it up to an adapter, but then it's not as portable. In summary, a nice radio that has provided me with easy access to previously difficult to receive am-fm stations. Great radio for the money! This radio is the best of its type for the money. The Sangean 505 gives you SSB and a nice fine-tuning knob, but it is considerably more expensive, and also quite a big larger. If all you want is a good, small, AM/FM, basic shortwave radio with a speaker and memory, you can't beat this. I find its reception to be quite good, on all 3 bands. As far as battery use, it works very smoothly with rechargables. It has a 3-segment battery indicator that displays when you first turn it on. When only 1 segment is lit, it means you are getting toward the end (maybe about 1 hour left). At that point, you can charge a second set of batteries and install them when it finally dies. You can also just disregard the battery indicator and wait for it to die, and then charge the second set. As soon as the battery power gets too low, the radio shuts off, but still retains the time and memory station settings. It can run in this low-power mode for hours. In my case, I had 4 nicads in it that died, and it took me 6 hours to charge 4 NiMHs that I use as the 2nd set. The radio's time and memory settings were still intact when I finally installed the NiMHs (you have 3 minutes to make the actual switch). Very nice! memory feature doesn't work, sounds a loud 'chirp' constantly after one month of use. The Sangean ATS-404 is a budget minded travel portable designed for the business or vacationer on the go who wants to take a small receiver along for the trip. The radio is touted as an AM/FM stereo portable primarily, although the unit also is considered an entry level shortwave portable. The AM sensitivity and selectivity on this receiver is only fair, and if you are close to a transmitter, the receiver can be overloaded and spurious (secondary) signals will appear as you scan the band. FM is adequate, but the receiver is also prone to overloading in areas near FM transmitters, with stations appearing in places they do not belong. The shortwave performance on this receiver indicates that band was an afterthought, much like some boom boxes used to include one long shortwave band for novelty value. Even reception of strong signals available to North American shortwave listeners such as Voice of America, Radio Canada International, BBC World Service, Radio Havana Cuba and Deutsche Welle were not all they could be. The reception of good quality signals on shortwave requires a decent antenna, and the antenna on this receiver won't cut it. Attempting to hook up an external antenna overloads the receiver.